Here's the return of the other results thread for those oddball appearances of joshi wrestlers. 5. Takako Inoue/Jaguar Yokota defeated Manami Toyota/Mika (11:12) when Inoue used a Grand Octopus Hold on Mika. Shinobu Kandori was supposed to be in this match instead of Takako. I don't know the reason for the late switch. The whole card was bizarre. A 5 year old boy was billed as the youngest wrestler in history and beat Kikutaro in his debut. 2. Ice Ribbon Offer Match: Emi Sakura & Minami Hikari defeated Aoi Kizuki & Seina (12:21) when Sakura used the Nyan Nyan Press on Seina. The main event was a death match. Does anyone else find it weird that we go from an Ice Ribbon match with cute little girls and the nice lady Emi to lighttubes? 2. KAZMA, Boso Boy Raito & Apple Miyuki defeated Saburo Inematsu, Yuu Yamagata & Tadanobu Fujisawa (17:29) when KAZMA used the AX Bomber on Fujisawa. Does anyone else find it weird that we go from an Ice Ribbon match with cute little girls and the nice lady Emi to lighttubes? For this weekend, results from Hawaii and from K-DOJO. Tsunami retires. After the match, Hikaru makes friends with Hawaii's kids and romps with them...but where is Go-go...? So I guess it was 2 matches. How dignified for Saki, our AWA champ, to scrub the shitters. At least Hikaru didn't get hurt. 2. Taj Mahal Cup One Day Six Person Tag Tournament - Semi Final: Apple Miyuki, Boso Boy Raito & Quiet Storm defeated TAKA Michinoku, JOE & Yuu Yamagata (12:47) with a German Suplex Hold by Miyuki on Yamagata. 4. Taj Mahal Cup One Day Six Person Tag Tournament - Final: Yuji Hino, Shiori Asahi & Makoto Oishi defeated Apple Miyuki, Boso Boy Raito & Quiet Storm (12:55) with a Powerbomb by Hino on Storm. It appears being a member of the Apple Miyuki Army is liking being a Cubs fan. Wait until next year. Wait a second...so after Saki establishes that she can be a winner, she loses her next match and has to clean toilets. Boy, there's establishing championship credibility for ya. Aloha! I witnessed the match. Saki had somewhat hesitation about acting as a heel. On the other hand, our Tracy surrounded by fans had a motivation. Luckily or unluckily, it's a nontitle "Loser cleans beach toilets" match. The rumor says Saki started cleaning beach toilets at 4:45 a.m. in the following morning. Yeah, I guess she would be even less used to heeling it than Hikaru would. How can anyone throw heat at Saki, though? She's too damn cute for heelishness. Couldn't they just do a good clean face v face match? I am guessing that there is no chance to see those matches online? Oh well if I can get a hold of the DvD I will on this one occasion. Couldn't they just do a good clean face v face match? I think that's too simple... or logical. I've got a bunch of dojo shows, indy appearances, offer matches, and other such oddities that don't warrant a new thread. 1. Eiger defeated Lingerie Muto (7:11) with a Horizontal Cradle. 3. Cherry defeated Aoi Kizuki (9:29) with a Cradle. Anything about BattlARTS I find is from Lukie's blog. I saw the Amano-Kimura match recently. Fun stuff. They sure screamed a lot! 2. Dump Matsumoto defeated Kikutaro (6:48) with a Body Press. Yes, the oldest woman in joshi (older than Jaguar) still "works" occasionally. This match probably did not earn many Meltzer snowflakes. 3. SUN Offer Match: Nanae Takahashi/Natsuki*Taiyo defeated Hikaru/Saki Maemura (16:23) when Takahashi used the Nanarocker on Maemura. 2. SUN Offer Match: Nanae Takahashi/Saki Maemura defeated Hikaru/Natsuki*Taiyo (14:57) when Maemura used the Hanamaru on Taiyo. Standard SUN offer match results. I hope Saki enjoys not being a jobber for a little while. 2. Sakura Emi defeated 726 (6:25). 3. Chou-un Shiryu/Cherry defeated Prince Mickey/Riho (11:51) when Cherry beat Mickey. I think UNION is an offshoot of DDT. I found their website and I noticed that I'm almost 100% sure the same person is the webmaster for UNION, NEO, and Ice Ribbon. Does all of these promotions have the same backing, or maybe just hired the same web designer. Oh, I don't know who half these people are or what the finishers were. 2. Antonio Honda defeated Apple Miyuki (8:13) with a Diving Fist Drop. 5. Xena/Francoise* defeated Kikutaro/Ram-chan (11:02) when Francoise pinned Kikutaro. This is the third show of what looks like yet another goofy puro indy, featuring a lot of the typical indy/free-lancer types. If my translation is anywhere near accurate, it sounds like little Ram-chan had Francoise in a Delfin Clutch, but Francoise no-sold it and went on to pick up a win (her first?). Maybe this is some sort of gimmick-the 666 Girl can chokeslam 2 grown men at the same time but can't defeat Collagen Babe? 4. Asian Coogar defeated Kyoko Kimura (8:49) with a Diving Foot Stomp. Kyoko plays with the guys quite a bit. 0. Exhibition (5 Minute Time Limit): Hiren vs Mari Harada (5:00) went to a Time Limit Draw. 1. Aya Mizunami defeated Hiren (8:57) with a Second Rope Guillotine Leg Drop. 2. Jaguar Yokota/Tyrannosaurus Okuda defeated DASH Chisako/Sendai Sachiko (11:39) when Okuda used a Top Rope Diving Knee Attack on Sachiko. They set up a ring outside at a car race. Here's a new tool for translating kanji that I found: http://www.csse.monash.edu.au/~jwb/cgi-bin/wwwjdic.cgi?9T It's clumsy to use for full text, but it seems to handle proper names better than any other tool that I know of. So "Aya Mizunami" might be correct rather than "Mizhaaya". I think the idea of the name was to combine elements of her family and given names with the idea of a big wave. The truth will be known once a Sendai show with her new name makes it on GAORA and to the dealers. Oh, and the new girl might be "Mari" or something close to that and she had a dress rehearsal before her official debut on 11/18. 0. 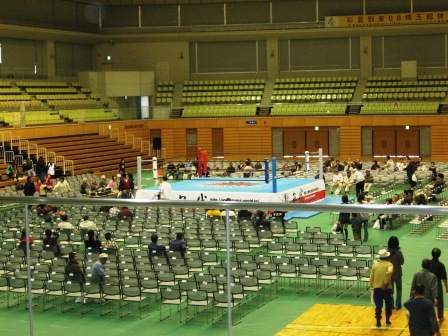 Exhibition (5 Minute Time Limit): Aska Ohki vs Mayuka Shinzeki (5:00) went to a Time Limit Draw. 1. Sachie Abe/Tojuki Leon defeated Azumi Hyuga/Arisa Nakajima (14:31) when Leon used the Mad Splash on Nakajima. 2. Halloween "Deathmatch": Tsubasa Kuragaki/Kayoko Haruyama/Kaori Yoneyama defeated Command Bolshoi/Keito/KAZUKI (17:00) when Haruyama used a Lariat on Bolshoi. As usual, the JWP girls are silly in the dojo shows. The main event involved chestnuts somehow and was billed as a Halloween Deathmatch, although I bet it wasn't really a deathmatch. Also, their new girl had an exhibition before her debut, which probably won't come until 12/31 and Jr. All Stars. Get used to jobbing, Arisa! NEO never posts their dojo show results, so unless we get a blogger report, it'll be a mystery. There was some stuff on the President's blog about some guests (Ito Dojo, I think) and some new nonsense involving "Indian Pro-Wrestling". I guess once they blow off the NEO Machine Gunz vs Chinese Pro-Wrestling stuff, they'll need a new country to mock. 2. Apple Miyuki defeated Nakagawa (7:24) with the German Suplex Hold. 4. TAKA Michinoku, JOE & Quiet Storm defeated Ryota Chikuzen, KAZMA & Yuu Yamagata (18:08) with the Super Pump Kick by JOE on Yamagata. The Apple Miyuki Army rejoices! Maybe her lips weigh too much? I fully expect a joshi match at the 11/11 BattlARTS Shinjuku FACE show. Hey Lukie, has Mai or Fuuka ever participated on a BattlArts shows? The matches at the Koshigaya Citizen Festival weren't fought under BattlARTS rules, nor the actual BattlARTS banner. Emoto seems like an odd one. According to stuff I found Googling, Dump was born 11/11/1960, Jaguar 7/25/1961, Devil Masami 1/7/62, Lioness Asuka 7/28/63, Chigusa Nagayo 12/8/64. Dump, Lioness, and Chigusa all debuted in 1980, while Jaguar debuted in '77 and Masami in '78. Dump was almost 20 when she had her first match, which would have been unusually old for a rookie in AJW. I think she actually got to continue a year or two past the retirement age of 26 as well, for some reason. Now back on topic. Here are this week's CHICK FIGHTS SUN offer match results from the current ZERO-ONE MAX tour. The usual people win and job. The only strange things are no Hikaru and them using Aja for a house show. 3. SUN Three Way Offer Match: Nanae Takahashi defeated Saki Maemura & Natsuki*Taiyo (11:35) with a Backdrop on Taiyo. 4. SUN Offer Match: Aja Kong defeated Saki Maemura (12:44) with a Diving Elbow Drop. 3. SUN Offer Match: Nanae Takahashi defeated Natsuki*Taiyo (12:30) with a Backdrop Suplex. The Ayakos went to Muga World Pro Wrestling. 2. Ayako Hamada def. Ayako Sato (12:31) with the AP Cross. The fans who took these pics said it was a good match though "unrelated" to Muga World. And that the crowd got into it and even through out some cheers. Another week, another set of SUN offer matches. 3. Chick Fights SUN 3 Way Match: Nanae Takahashi defeated Saki Maemura & Natsuki*Taiyo (13:26) with a Backdrop Suplex on Taiyo. 3. Chick Fights SUN 3 Way Match: Saki Maemura defeated Nanae Takanishi & Natsuki*Taiyo (10:49) when Maemura pinned Taiyo. 3. Chick Fights SUN Offer Match: Saki Maemura defeated Natsuki*Taiyo (13:33). 4. Chick Fights SUN 3 Way Match: Nanae Takahashi defeated Saki Maemura & Natsuki*Taiyo (17:20) with the Nanarocker over Maemura. 2. 3 Way Match ~2007 Final Chick in Osaka: Saki Maemura defeated Nanae Takahashi & Natsuki*Taiyo (11:26) by using the Flower-Maru on Taiyo. 5. Heaven or Hell: Mitsuhiro Matsunaga & Aja Kong defeated Shinjiro Otani & Hikaru (10:02) when Kong used a Vertical Drop Brainbuster on Hikaru. I'm not 100% sure why Hikaru didn't participate in anything except today's show in Osaka, but I think she might have been held out due to some sort of injury. I don't know if she will ever get the big win over Aja or if she will be the joshi JTTS (jobber to the stars) forever. Also, according to Frankie's blog, there's a bunch of B.S. going on about the status of the AWA Women's belt. Apparently the evil gaijins at the AWA are in cahoots with the HCW (Hawaii Championship Wrestling) and they might strip Maemura of the title and give control of the belt to HCW. This might actually have happened-I can't make sense of the crap on the SUN news page. It's all just a bunch of kayfabe and I think they are building to a HCW vs ZERO-ONE/SUN feud. Seriously how are they going to build to a feud between the group when HCW has even less women in their promotion than SUN. I think they have maybe 3 including Talyor. Remember, ZERO-1/SUN/HCW are doing that series of shows in December (4 in Japan and 1 in Honolulu, I believe). I know the HCW female roster is rather thin. My guess is that the women's part of these shows will only involve 1 or 2 of the SUN girls or some random gaijin women will be brought in and claimed as part of HCW.